A few days ago, I read with great interest Brett Rushforth’s comments on the decision by the history department at the University of Oregon (of which he is currently chair) to discontinue their “Western Civilization” survey courses and to end the practice of affording core curriculum and history major credit for AP World History. You can read his recap of the department’s rationale here. Whether or not our colleagues have made the best decision here – and, as someone who has been jonesing to teach a Western Civilization survey for a long time, I felt a bit of a pang to read this news — they have certainly made a very principled and considered decision. And they have made a very brave one. If the culture wars over the “Western canon” and “Western civilization” got ugly in the 1980s (and they certainly did), the backlash to a de-centering various notions of “the West” has become manifestly – that is, openly and proudly – monstrous, menacing, and even murderous now. Indeed, white supremacist terrorists who march into mosques or synagogues to kill in the name of “the West” or “Western civilization” are but the most extreme indicators that something is deeply wrong with the very concept they imagine they’re defending. The concept itself – “Western civilization” as some coherent whole, with a continuous arc of intellectual and cultural development that traces the course of the sun from the Mediterranean East to the Euro-American West – is a fairly recent idea. In the United States it begins to crop up in the mid nineteenth century. But it doesn’t make its way into the undergraduate curriculum as a subject of instruction until the early 20thcentury. And of course it never really takes hold as a coherent or substantial field of research. There may be a couple of outlying PhD programs in “Western Civilization” – I haven’t tracked them down – but this is not a field of specialization in American universities. One might just as well argue that everything studied in American universities is automatically included within the compass of “Western civilization” simply by virtue of appearing in the catalog. And if everything is Western, then nothing really is. I think that’s what the white supremacists are actually afraid of. I don’t know all of the turning points I’ll end up marking out in this “Civilization” chapter, but I do know that one of them will be the rise of the notion of “American civilization” – including the rise of the notion of “the rise of American civilization.” This means I will be spending some time with Charles and Mary Beard and their monumental work. 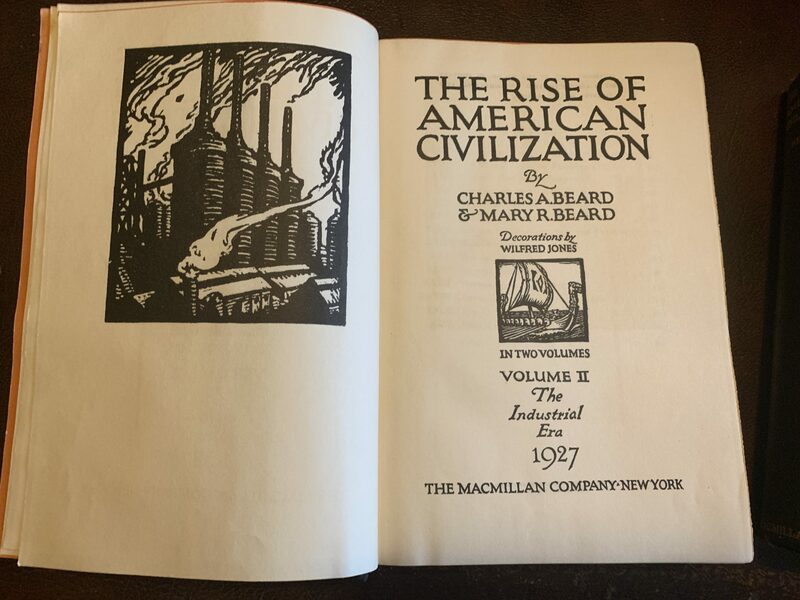 I have obtained some decent copies of the first edition (though not the first printing) of The Rise of American Civilization, published in two volumes. As you can see from the photos in this post, these were very handsome books, with gilded lettering on the spine and a small gilded medallion on the front cover, an abstract motif in imitation of Native American pottery designs from the desert southwest. But of course the showstopper among the illustrations for these books is the map spread over the endpapers, front and back. The color scheme and border design are reminiscent of a red Attic vase, a Grecian urn superimposed upon the American landscape. The large wagon train arcing across the middle of the map carries the viewer’s eye from east to west: the progress of civilization. In each region of the country different emblematic figures appear, from a southern belle to a Texas cowboy to a New England woodsman felling a tree. But there is also an enslaved woman picking cotton, a Californio in a broad sombrero serenading a señorita who modestly holds up her fan, a pair of Chinese laborers, and next to two tipis a Sioux chieftain astride his horse. All these figures are contained within the national borders of the United States – Canada and Mexico are unpeopled, blank spaces counterbalancing the central motif of civilization’s progress. In the seas of black ink surrounding the land are sailing ships and a sporting sea monster, and a compass whose rays extend north, south and west – the line that would stretch to the east, to the Old World, is cropped from view. It must be imagined – or, perhaps, imagined away. This was “American civilization” circa 1927, and that concept did attain a coherence and a prestige as a field of study in American universities that “Western civilization” did not. As I work my way through this chapter, it will be important to understand and to explain why that was the case. But that this was and is the case means that, while “Western civilization” might come and go from the undergraduate catalog, “U.S. History I” and “U.S. History II” will hang around a while longer. At least I hope they do. I know a few scholars who find the survey problematic for philosophical, political, and pedagogical reasons, and I had at least one professor who flat out refused to teach it. I guess that’s what adjuncts are for. In any case, I’ll be deeply immersed in the discourse of “civilization” for a while, and I hope our readers here will not just bear with me but also help me think these things through. A key text in that regard, and one I will blog about next time I return to this theme, is Tommy J. Curry’s stunning, bracing, brilliant new book, Another white Man’s Burden: Josiah Royce’s Quest for a Philosophy of white Racial Empire. If you don’t have a copy, I encourage you to get one and read along with me. I very much appreciated seeing this endpaper illustration. I wonder if the Beards had any say over it. Obviously, it’s similar, but more inclusive and less … well, imperious, than the American Empire painting reprinted in all US History survey textbooks. Anthony — yes on the comparison between this and the John Gast painting, and yes on paying attention to the materiality of books as both reflecting and shaping the ideas conveyed through them. I think putting this illustration alongside the Gast illustration would make for an interesting lecture in the survey — or, for that matter, an interesting paper or talk. One thing that usually comes up when I discuss “American Progress” in class is that mythos of continental “emptiness” — you see a few native people fleeing before the colossus, but beyond that it’s just buffalo. The 1927 illustration for the Beard book, by contrast, at least shows that “manifest destiny” meant displacing not only Native peoples but also other colonizers who had earlier laid claim to parts of the continent. And of course the mere acknowledgment of Black slaves and Chinese immigrants is a marked contrast to the Nast painting. And to your other point: When we’re talking about ideas conveyed “in” or “via” books, we intellectual historians need to look at the books themselves (and the magazines, the newspapers, the pamphlets, the playbills, etc). I really have found it to be important in my own work, and it has led me to “discoveries” that other historians have not made, even though they’ve been writing about many of the same texts I’m writing about. I have caught plenty of flak for insisting that ideas are not immaterial and should not be treated as such, but I’m still standing and still writing, so I think I’ll live and maybe even flourish. And if we insist on the immateriality of ideas out of some imagined deference to the primacy of ideas themselves as objects of historical inquiry, we’re actually doing ideas a disservice as historical subjects; we’re not really looking at the ideas in their entirety and/or in their time, but we’re “extracting” them from everything that made them what they were in a particular moment. 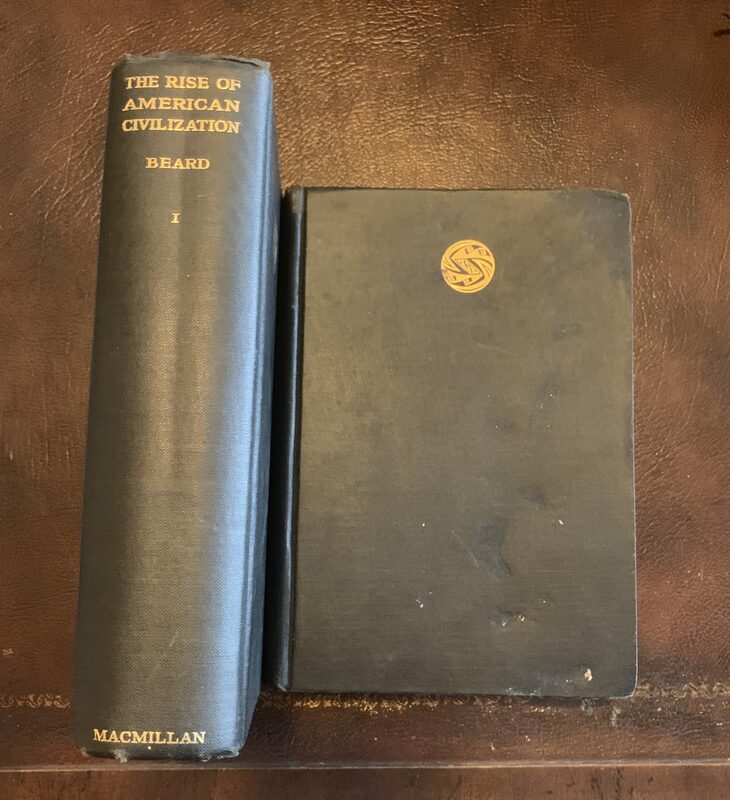 If almost all readers in 1927 could not encounter the monumental work of the Beards without taking in the woodcut illustrations throughout the book, but we focus only on the Beards’ words, we’re misled and perhaps misleading in how we discuss/understand the broad impact of their books. It really boils down to a debate between transcendence v. immanence, and I tend to come down on the side of immanence every time. I can hardly do otherwise. LD – I know you’re familiar with Veysey’s Emergence, and you probably recall his brief comments in the chapter on “liberal culture” on the origins of Western civ courses, along with early courses in intellectual history, with which they appear to have been associated. [Veysey, 1965, 207] Perhaps you haven’t seen two articles that might be helpful: Gilbert Allardyce, “The Rise and Fall of the Western Civilization Course,” AHR 87, 3, June 1982, and Daniel A. Segal, “’Western Civ’ and the Staging of History in American Higher Education,” AHR 105,3, June 2000. 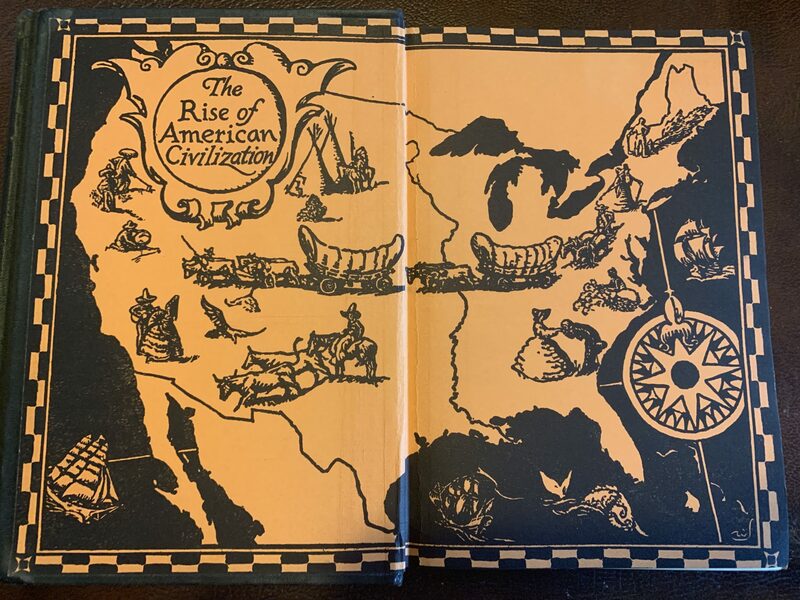 I have a copy of the 1930 one volume edition of The Rise of American Civilization with decorations by Wilfred Jones that does not include the endpapers map. I haven’t compared the illustrations through both editions, but the one opposite the title page in my copy is of a farmer, not a steel mill. Thanks Bill. I tossed Allardyce a mention somewhere in a comment below (above?). I had forgotten the Segal piece so I had better look at that before I reinvent any wheels. I do push back a little bit against Veysey’s explanation for the origins, which is also to some extent Andrew Jewett’s — maybe not so much push back as “complicate” it, as we say. The Columbia “War Issues” courses didn’t turn straight into “Western Civ” courses — they first went through a “Social Problems” or “Problems of Citizenship” phase: historically informed, but leaning more heavily on sociology, economics, and political science. That’s not to say that geopolitics isn’t profoundly influential on the development of “Western Civ” as a general ed staple in the 20th century — it’s certainly influential in who is and isn’t part of “the West,” which changes quite a bit. And it’s no accident that the multicultural turn at Stanford (and elsewhere) happens in what turned out to be the waning days of the Cold War. I guess at this point tracing the place of the course in the curriculum is just part of the larger project of the chapter, which is tracing the course of this concept of “Western civilization” in and out of higher education. But maybe that is too much for a chapter. My students informed me today that the end of the chapter I gave them to read should really be the start of a separate chapter — this was quite helpful, and I love that they weren’t shy about discussing and dismantling my draft. So, the jury is out on where I will go, but I will take your comment under advisement! Here is some work in progress to n the history of ‘western civ’ and ‘civiliztion’. This is fantastic! Thank you so much for sharing. I will cite this work for sure! I would urge you to take a look at a book I’ve mentioned before — Patrick T. Jackson’s _Civilizing The Enemy_. I never got around to reading it (but then I’m not writing something on the idea of Western civ.). As I’ve also mentioned before, I’m acquainted w Jackson (though we’re not friends and I haven’t had any occasion to communicate w him in a long time). Always glad for a bibliography suggestion — thanks Louis! Richard, I am not certain of the “firstness” of Norton’s usage within academe, but it’s certainly a pivotal one. I have been looking at a different set of sources than Rebecca Futo Kennedy (who commented above with links to her excellent overview of the career of “western civilization” as a term that links the Greco-Roman world to post-cold-war America), but have made some similar findings that would, I think, justify this framing: “western civilization” as a term begins as a handy synonym for “contemporary American life” (including, as Futo Kennedy notes, “frontier life” beyond the settled Eastern seaboard) and gradually takes on more “history” (and geographical extension eastward across the Atlantic and the Mediterranean) as it goes. So I think your instinct above, to see “Western Civilization” as an idea that derives from “American Civilization,” rather than vice versa, is basically correct. “Western civilization” begins as a popular term and takes on first a contemporary geo-political meaning and then a historical (or transhistorical) meaning. I will take this opportunity once again to plug Tommy Curry’s book on Josiah Royce. While I think his particular reading of Royce is important and illuminating on this point, I think the more enduring legacy of the book will be — or should be — Curry’s methodological challenge to his own discipline (philosophy) as well as to the discipline of intellectual history. When we intellectual historians deal with our own canonical thinkers or with sets of canonical thoughts — our usual suspects, as it were — we make all kinds of determinations about what is accidental and what is essential to their ideas. And Curry argues that our usual move is to treat the evident racism and imperialism that has leavened the whole lump of Roycean thinking as somehow not significant in understanding Royce, to the point where we read Royce as “enlightened for his time” while at the same time reading him as “simply reflecting the larger prejudices of his time.” And we don’t just do this for Royce, but for, say, the Pragmatists and Pragmatism as a whole. So Curry’s book is a case study about the racist discourse of civilization as central to Royce’s ideas, but it’s also a case study in the ways that both philosophy and intellectual history systematically deny the significance of something that was so evidently significant to Royce. Finally, let me just say that I’m delighted at the broad circulation of this blog post and the many helpful responses to it here and on Twitter. This is the first piece of semi-coherent, semi-focused writing I’ve done in a little bit (haven’t been feeling well), and it is generating some comments that are really helpful for me and also has uncovered some connections that seem to be helpful for others as well. But I think I must have left a sentence or two in draft or lost it somewhere in a copy-and-paste when I was rearranging things, because in the paragraph where I talk about how “Western Civilization” is not something American universities generally grant a PhD in, I wanted to make this point explicit (right now it’s only implicit): This is how we know “Western Civilization” has no coherence as a subject of inquiry; given how the economics of higher education works, if Western Civ were remotely close to being an actual field that could be even loosely defined within disciplinary boundaries, there would be PhD programs in it all over the place. But it hasn’t really even caught on as an interdisciplinary field. It’s mostly a political and racial idea, and it has been an idea whose content (that is, the answer to the question, “In what does ‘Western Civilization’ consist, or in what has it consisted historically?”) has had so many different answers that it really has none at all. But Norton’s answer was at least an early attempt to give this idea scholarly coherence, and an influential one too. I don’t think I’ve answered your question. But I’ve enjoyed thinking out loud with / at you! James G. Turner has a chapter entitled, “The Invention of Western Civilization, 1895-1898” in _The Liberal Education of Charles Eliot Norton_. He also discusses the idea of Western civ within the wider US intellectual / educational context on pp. 102-104 of _The Sacred and Secular University_. Might be interesting to chart the genealogy from Norton –> Royce –> Beard! One cluster of concerns that hasn’t been mentioned is described and analyzed in Daniel Bell’s The Reforming of General Education, a sweeping overview of higher education reform that developed in the first half of the last century. Bell’s focus falls on educational reform at Columbia College as well as Harvard and Chicago. By the way, David Riesman’s work on education, including on historically black colleges, should also be factored into this historical analysis in the 1950s and 1960s . My memory is hazy, but when I was a freshman at UNC in 1959-60, our introductory history course was called “Western Civilization.” I think it is significant, in retrospect, that the basic history course was not US History, but the history of an entity wider than a particular nation state. Considering my limited perspective at the time, having had only one History course at Chattanooga High School–it was US History–, the expanded focus at Carolina came as a kind of intellectual liberation. We also schlepped around a big thick book of readings, the CCW(“Contemporary Civilzation of the West”) that was part of the Columbia reforms, I think. This was an introduction to, among other things, use of primary sources and experienced by most of us as interesting but very difficult. One carry-away point is that “our” present arguments about the West v. the Rest, the constructed nature of traditions and civilizations, and related issues seem pretty esoteric. At the time, they were hardly registering on the charts. The revolution in higher education triggered off by the impact of the Civil Rights Movement and the Black History/Culture/Aesthetic is hard to overestimate. One other dimension of this rethinking of higher education in the early 1960s was the general reaction against Deweyan process thinking. Still, thinking back over how much I didn’t know about everything then, I feel reluctant to sound off with too much certitude about what we should have been studying and the frame of reference we should have been using. All that said, LD’s project of re-examining the intellectual history of university curriculum and what it reflects about the state of the(sic) culture is not just “good for us”, it is intellectually fascinating. Richard, thank you so much for this comment. The Daniel Bell book is literally sitting on my desk — just tweeted a picture of it for you; should show up in our blog sidebar shortly — but I haven’t cracked the cover yet. On Riesman, I have the co-edited volume with Christopher Jencks and the co-edited volume with Stadtman, which is really useful for dealing with the changes from the ’60s into the ’70s. But it has probably been two years since I’ve cracked the cover of either one, so thank you very much for the reminder to move these back up in the queue for this chapter. Columbia’s role in defining and redefining “civilization” in educational contexts is so crucial, from the WWI “Problems” course to the first iterations of Western Civ after WWI to all the publications and series of Teachers College and to the whole series of primary source documents from the university press itself, a series that ran from 1914 well into the 1960s, I believe. But now I have to get a copy of “Contemporary Civilizations of the West” so I can see just what you were reading at UNC “back in the day,” as my students say. You’re absolutely right about the rise of Black History/Black Studies within PWIs as being a pivotal moment, and I would put Feminism/Women’s studies alongside that — along with, importantly, Title VII. That combination of pressure from within and pressure from without pushed higher education in some new directions, and there has been plenty of pushback. Perhaps you (and anyone else with some wisdom on this kind of stuff) can help me wade through a particular mess I’m dealing with in my current chapter. Basically the problem is this: there are many, many monographs on the history of the undergraduate curriculum or some aspect of it, from Bruce Kimball’s somewhat esoteric Orators and Philosophers to Julie Reuben’s indispensable work on the rise of science as a moral/ethical pursuit, to Frederick Rudolph’s comprehensive survey of major curricular trends from the founding of Harvard to 1977 (literally). But I feel it is necessary to write my own chapter, and to embrace practically the same chronological sweep as both Kimball and Rudolph. I think it’s necessary because it seems to me that relatively few of us in higher education “know the history” of our own “industry” as it were, or our own disciplines within them, and without that grounding it’s hard for readers to understand what was (and wasn’t) at stake in a curricular debate that stands upon that unexamined history. And it’s necessary background for the debates of the ’80s. But what I find myself doing instead — and I’m about 12,000 words into this chapter now — is hardly more satisfactory, because I do feel that my focus in this chapter is kind of all over the place. Am I trying to condense the key insights of Reuben, Jewett, Kimball, Rudolph, Turpin, Winterer, et al.? Is this a glorified “review of the literature”? If so, it really has no place in the book. That’s not what I’m trying to do. What I’m trying to do, I think, is use this chapter to take that “general knowledge” (it’s general in my head, anyhow) and turn it in the particular direction (or, directions) that will illuminate the chapters focusing on the 1980s. But presenting in narrative form a fly-over view of “the” undergraduate curriculum for the whole purpose of saying, at the end, “And that’s how we get Stanford circa 1970″ seems perspectivally “off” to me somehow. The chapter must have a purpose beyond “setting the stage,” the chapter must have a thesis that contributes something new to the history of the undergraduate curriculum. I know the thesis is there, buried in this draft, but I’ll be damned if I’ve quite caught hold of it yet. All that to say, these are not the most riveting 12,000 words I’ve written in my life, but I don’t know what else to do but keep going and hope I can make sense of it on a revision. I feel your pain L.D! I’ve been reading about the history of higher ed off and on now for about 8 years and confess that the sum of my findings is pretty damn banal: “most of our institutional arrangements and curricular beliefs are the contingent products of a long series of (mostly) principled disagreements and compromises.” Not exactly a historical revelation! Still, I continue to be surprised by how little we (eductors in higher ed) interrogate key terms like “general education,” “core curriculum,” “electives,” “distribution requirements,” “the Western tradition,” “the liberal arts,” “critical thinking,” etc. I frequently hear perfectly reasonable colleagues, some of whom are even historians (! ), marshal these concepts during faculty discussions as if they were stable and unchanging and coherent rather than largely incomplete and contradictory ideas forged in the fires of history. The US system of higher ed. is extremely unusual in its historical formation when compared to other national systems of education–yet most of us don’t know how or why. It contains a multitude of contradictions, which makes it hard to defend or explain coherently (David Labaree’s schematic but brisk book, _A Perfect Mess_, is so good on this!). As for how to shape the chapter, I don’t have a clear solution (obviously). I will say that of the books I have read that tread similar ground as you do, the ones I’ve most enjoyed typically have a polemical thesis / lesson to draw from the history they recount. I think that description would hold true for most of the titles cited above (Kimball, Rudolph, Reuben), and it would hold true for other overlapping titles, like Turner (Sacred and Secular University) and Guillory (Cultural Capital). As someone who is not terribly familiar with the Stanford debate and its context (i.e. a potential future reader of your book), but who does know a bit about the broader history, the thing I want to know is why did the Stanford debate / conflict take _this particular discursive form_–i.e., why did it become a debate about “the canon” or “the West” rather than, say, a debate about “immigrants”or “truth” in postmodern times (or did it)? I guess I’m wondering what you see as the _central_ issue vs. the _tangential_ issues in the “Stanford” debate. Of course, everything is related to everything else, but is there a way to generate some kind of analytical priority/hierarchy? (I’m not good at doing so, so I will appeal to the power of contrast: how you might contrast the curricular debate of the 1980s with the “civilization” debates in the 1920s-1930s as discussed by Bell and Guillory’s “The Failure of Gen. Education”) and Jerome Karabel’s _The Chosen_–namely that the invention of “general education” was an attempt to help non-WASPs assimilate into American society? What was the core social issue driving the Stanford debate — race? gender? the market? US geopolitical outlook? the legacy of the 1960s? Perhaps that’s too simplistic a question . . . There had been, of course, many previous curricular debates (i.e. the debates discussed in a very streamlined way in Carnochan’s _Battleground of the Curriculum_) still hovering over some of the issues addressed at Stanford, but few of the prior participants (e.g. Newman, Arnold, Oxbridge, Erskine, etc.) seemed to hone in on the idea of a canon as the principal issue / weapon. This historically new obsession with “the canon” is basically what Guillory contests, isn’t it? That our fixation on a canon (whether conservative or liberal) is a historically new (and mistaken) idea? I would be curious to know how you might situate Guillory’s critique within a longer historical trajectory. But that may not be what you are aiming to do, either. Stumbled across online (I’m guessing you’re already aware of this book, but just in case not): A 1990 collection of essays by H. Lindenberger, The History in Literature, which includes a piece on the Stanford curriculum battles (the text of it is available at a link with pbs.org in the URL — perhaps b.c it was intended as background reading for a PBS program?). I just glanced quickly through the essay, and he appears to cover the curricular/historical background in a few paragraphs, which is not to say, of course, that you should necessarily do the same in your book. Louis and Patrick, thanks for your comments. I’ve read both Lindenberger and Carnochan, but both are problematic as anything other than primary sources, because they were written on the heels of and very much in response to the Stanford debates. And precisely in those places where you would like to be able to rely on them for historical purposes — that is, in the places where they give a brief history of the curriculum, or the curriculum at Stanford specifically, or whatever — they are most unreliable. The best published accounts of curricular history at Stanford are Julie Reuben, Rebecca Lowen, and — to an extent! — Gilbert Allardyce’s article on the rise and fall of the Western Civ course. But Allardyce falters in precisely the same place where Lindenberger and Carnochan do: when he begins to discuss events in which he himself participated, he substitutes his memory and his impressions for a close reading of sources. That’s the frame that I insist on stepping out of. I don’t care for the Labaree book, though I may use it anyhow. I mean, at least it’s not a declension narrative, but it’s weirdly Panglossian in its embrace and celebration of the market. Guillory has long seemed right on the money to me, and I have written about him here at the blog before, if I recall correctly. I will return to him somewhere in the book — not sure where. Yes, I am planning on answering the question, “Why did the debate entail arguments over a list of books, as opposed to some other thing?” And that’s one reason that I am paying such close attention to books as material objects. That, and it’s hella fun. I have read zero secondary literature on The Rise of American Civilization, so I have no idea if I’m the first person to suggest that the endpaper map evokes a red Attic vase –but that is a killer observation, if I do say so myself! Anyway, thanks for reading and for the provocative questions and the many suggestions. I agree that the most interesting books, and sometimes the most helpful ones, have a bit of a polemical edge to them. But if I could do anything with this book, it would be to de-polemicize the Stanford debates and render them utterly useless as a “kids these days” rant for anybody. Fat chance. Thanks for this, Patrick. Walter Benjamin was right. I have decided to deal with the problem of writing my “curriculum chapter” by turning it into two chapters. This solves one problem: how to shift from a broad survey of “the undergraduate curriculum” since Harvard’s founding to a more narrow focus on the history of Stanford’s curriculum in particular. But it creates other problems, and the biggest of these in my view is this: there are no more than, like, nine people in the entire world who would be willing to slog through yet another historian’s account of the history of undergraduate education in the US, never mind slogging through a follow up chapter on Stanford, and half of them are commenting on this thread. Two chapters seems…excessive. Anyway, another 12,000-15,000 words of backstory on “the curriculum” and then on to the discourse of civilization.